Aquarium and Fish Care: GREEN TERROR CICHLID - An Intro To This Amazing Cichlid Fish! GREEN TERROR CICHLID - An Intro To This Amazing Cichlid Fish! The Green terror cichlid (Andinoacara (Aequidens) rivulatus) is frequently confused with Blue Acara, somehow there is a slight difference in their features which is, green terror has a more pronounced bump on its forehead when they mature. They are also more aggressive than the other fish that is why it is important to keep them with varieties that can fend themselves. They are widely spread in South America, Ecuador, and Peru. They are commonly found in still and sluggish waters of the local river basins. Generally speaking, when looking at the side angle of a terror the shape is obviously oval, in the front angle, it is evident that this variety has a very broad forehead area and gradually decreases down to its rear. The mature male, however, tends to develop a noticeable hump and may also reach a length of about 8 inches in its regular size. It is the male in this variety that is catchy to the eye of the hobbyist possessing a body color of a brilliant and bright greenish white. The tails especially are very attractive that is demonstrated with reticulation and fringed in bright red color... Really magnificent! The female is rather not much of a head turner with drab olive green color and does not have the favorable metallic feature of the male. Somehow some females may possess a blue-green color of its chin. Green terror cichlid is somehow a hardy fish and may be quite easy to care for especially when needs are met. They are basically omnivorous and will always eat on anything and may relish any live foods. They thrive well on large tanks with copious caves and rocks to hide in such as driftwood, rockwood, and live plants as well. Live plants though may be uprooted because of their agility and aggressiveness. When young they may be placed together with other community cichlids nevertheless as they mature they tend to live up to its name the "green terror" and will seemingly terrorize all except for the largest fish in the tank. Needless to say, they are best kept in a species tank. The adequate tank size of this variety should be approximately 48 inches with water that is soft to hardy and a pH level of 6.5 to 7.5 and kept in a constant temperature of 72 - 82 degrees Fahrenheit or 20 - 24 degrees Celsius. Like any other cichlids, by providing them with the proper filtration, temperature, and frequent water change will live healthily and vigorously. Breeding a green terror cichlid, always choose the most robust fishes and paired with an unrelated juvenile and raise to sexual maturity about three inches. They breed in a typical Aequidens way, meaning they will find an open water location and spawns in a flat stone. Unlike other cichlids that hide their nest, the green terror does not. 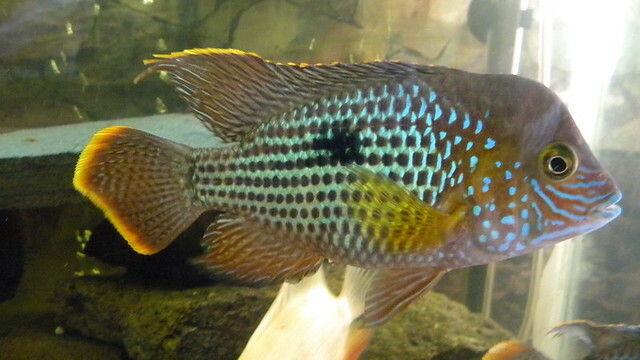 Check more on the breeding methods of green terror cichlid in order to spawn one of your own.